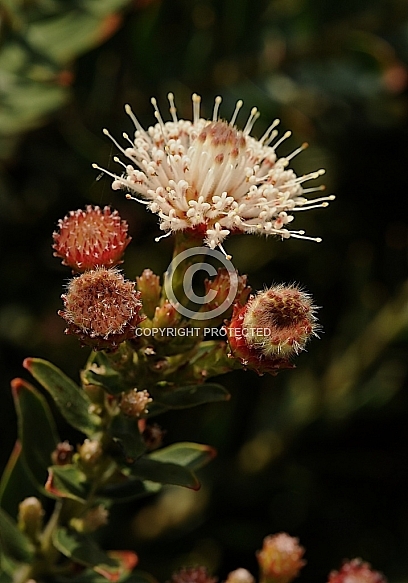 Description: Gordon’s bay pincushion, Witluisie < Figure 202 about here > A small-flowered species, L. bolusii forms a rounded, but erect shrub of 1.5m in nature, generally slightly less under cultivation, especially if picked regularly. The small, sweetly scented white flowers are borne from mid-spring to mid-summer and are useful for small arrangements and posies. This is not a particularly showy plant for the garden, but has curiosity value. In nature it is more spectacular as it often grows in dense stands of thousands of plants. Tolerant of light frosts and requiring good drainage and sunny positions, L. bolusii is relatively easy to grow in the right situations.